I Swear I Saw This records visionary anthropologist Michael Taussig’s reflections on the fieldwork notebooks he kept through forty years of travels in Colombia. Taking as a starting point a drawing he made in Medellin in 2006—as well as its caption, “I swear I saw this”—Taussig considers the fieldwork notebook as a type of modernist literature and the place where writers and other creators first work out the imaginative logic of discovery. Notebooks mix the raw material of observation with reverie, juxtaposed, in Taussig’s case, with drawings, watercolors, and newspaper cuttings, which blend the inner and outer worlds in a fashion reminiscent of Brion Gysin and William Burroughs’s surreal cut-up technique. 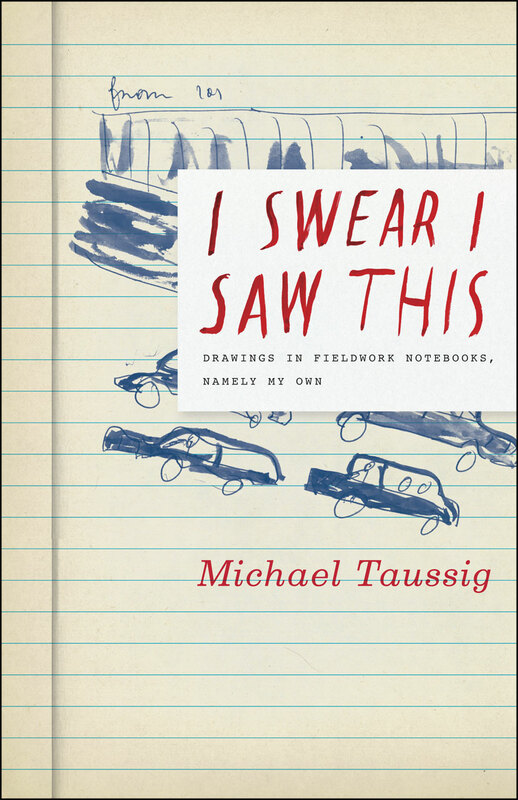 Focusing on the small details and observations that are lost when writers convert their notes into finished pieces, Taussig calls for new ways of seeing and using the notebook as form. Memory emerges as a central motif in I Swear I Saw This as he explores his penchant to inscribe new recollections in the margins or directly over the original entries days or weeks after an event. This palimpsest of afterthoughts leads to ruminations on Freud’s analysis of dreams, Proust’s thoughts on the involuntary workings of memory, and Benjamin’s theories of history—fieldwork, Taussig writes, provokes childhood memories with startling ease. I Swear I Saw This exhibits Taussig’s characteristic verve and intellectual audacity, here combined with a revelatory sense of intimacy. He writes, “drawing is thus a depicting, a hauling, an unraveling, and being impelled toward something or somebody.” Readers will exult in joining Taussig once again as he follows the threads of a tangled skein of inspired associations.